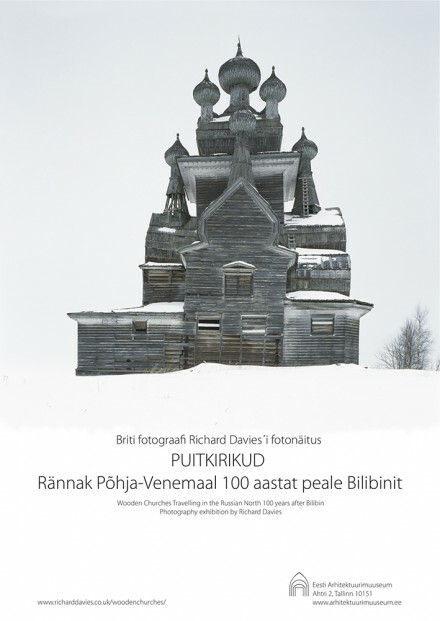 A Norwegian, a man from Switzerland and an Englishman are off to Berlin to print a book entitled Wooden Churches: Travelling in the Russian North. The prospect is exciting and daunting. 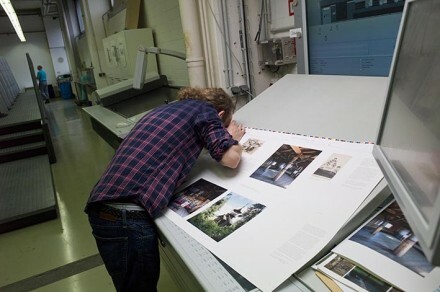 The Englishman has been taking the photographs for the book for the last 9 years – the man from Switzerland has been colour correcting the images for three months – the Norwegian one way or another has generously supported the project with his time over many years. We arrive at the printers at 7:23 am on Tuesday morning – 23 minutes late. The first sheet is laid out ready for our inspection – it looks good – very crisp and sharp – our six eyes study it intently. Flavio Milani, the man from Switzerland takes his eyeglass and checks the registration of the colours, the dot gain and overall sharpness. He checks the colour strip and the density of the black ink. We all stare at the images under the bright daylight balanced tubes murmuring quietly to ourselves and each other – is it too magenta? too cyan? too yellow? blue or green or red? too light? too dark? 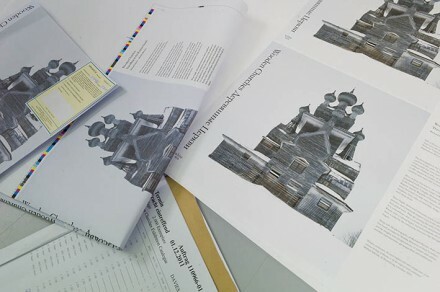 Adjustments are made and another sheet is printed – further tweaks are made and another sheet is printed. 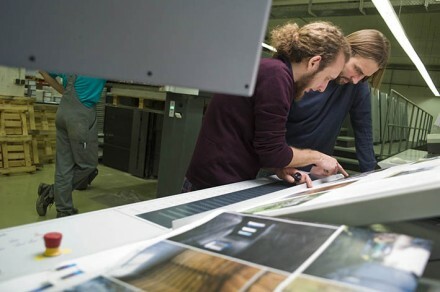 We are satisfied and retire to double-check the plotter proof for errors before the final plates are made. Over the last few weeks the text and type has been scoured by many for spelling mistakes, grammatical errors, typographical errors etc – what more could possibly be found? Within minutes Ståle Eriksen, the Norwegian has found a whopper – Peninsula spelt Peninsular three times – it’s from the title of a book we are quoting from, the cover of which Ståle has up on the computer screen within seconds – Peninsula it is. It’s not long before we find more – an indent, a space too many and then I check my emails. Yale University Press has given us permission, gratis, to include an excerpt from Chukovsky’s diaries – it is a tiny, but wonderful piece. As I hadn’t heard I’d assumed that ‘fair usage’ would cover us – we rush to pre-press. The plates have not been made for the acknowledgements page so we are able to add a polite ‘By kind permission of Yale University Press’ which we hope will keep the lawyers at bay. Phew! Meanwhile more sheets have rolled off the press, eyes concentrating we ask for adjustments here adjustments there and duly sign them off. On the way back to our holding bay Flavio is cornered and reprimanded by the Production Control Manager. She tells him that we are running behind schedule – in their grand plan we have been allocated 15 minutes to check the proofs and to make adjustments, we are seriously over the limit, on the first sheet we spent – 41 minutes, the second – 24 minutes, the third – 32 minutes. We promise her, fingers crossed behind our backs, that we will speed up but promise ourselves, fingers uncrossed, that we will not compromise the book. Making adjustments is not straightforward – each of our six eyes seem finely tuned to judge colour balance and we quickly agree (although obviously not quickly enough) on all these decisions but how do you judge how the image will look after the ink has dried in two days time – we rely on Flavio and the Press minders long years of experience. We sign off the last sheet of the day at 22:10 tired and famished (we have been well supplied with drinks and snacks at the printers but have burnt it all off with energetic eye movements and nervous energy). Eleven sheets (x2000) have been printed in 14 hrs – the PCMs schedule is in tatters. Our hunger is sated on the way back to the hotel by Mac Royals, fries and cokes. Today we have a lie in – the printers will ring to tell us when the press is ready to print our job – we all meet for breakfast at 10:25 – 5 minutes before the schinken is removed for the day. We ring the printers who tell us that we are expected at 2pm although we might have to wait a bit – we wait until 17:50 to see the printed cover – it looks good and we’ve fitted in a delicious Italian meal to build us up for the night shift and another dressing down from the PCM – Flavio, our only German speaker takes the full force of the onslaught – never in her ten years of experience has she ever come across a Flavio type person who needs more than 15 minutes to adjust a proof – what is he doing studying the control strip with an eyeglass? – by staying till ten last night we have upset the schedule for years to come – Flavio listens, ticking quietly like a finely made watch, shocked to hear that his ten or so years of experience go for nought. Ståle and I wonder why she is arguing the toss when we should be downstairs printing. It seems the PCM has set Flavio mission impossible – we must print 15 sheets (x2000) over night – Flavio using his rule of thumb works out that we need to take minus 35 minutes to judge each proof thereby freeing up plus 35 minutes for the Heidelberg and it’s minder to do what has to be done. Our hunger is sated by Mac Royals, fries and cokes. We settle in for the short night having been given strict instructions by the PCM that nothing is to be printed after 5am as the Heidelberg has to be made ready for the day birds. 3 camp beds are produced together with a bottle of wine for kips and sips. By midnight we are on the home run – one cover and five pages printed. 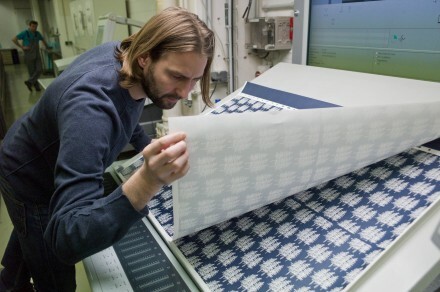 We now have 5 hours to print 10 sheets – it ain’t looking good – where the hell is Tom Cruise? Then a miracle happens, we sign off a sheet with two small images (one B&W) in two minutes and 32 seconds! . . . It’s 5am, cut off time – one cover and only 9 sheets – we have failed to meet the PCMs expectations. Flavio will get it in the neck tomorrow. Still we have another nights printing tonight and a whole day in Berlin to sleep! We sleep well in Berlin, on comfortable beds and sofas, thanks to the hospitality of Christof of Chipperfield. Back at the printers we learn that today’s day job is running late – a paper problem we are told by the press minder. The PCM can’t pin this onto Flavio so has left the office without delivering her daily dressing down. We have 3 hours before the Heidelberg will begin our job again. The Englishman spends his time trying to make sense of the situation – today’s Easyjet flights were aborted, it looks like tomorrow’s Ryanair flights will go the same way, when will we make it back to Blighty? Will we have copies of the book for Christmas? How long is a piece of string? We all begin to ramble from our lack of sleep. The Norwegian is editing his iPhone film of events. The man from Switzerland stares at his MacBook Pro. We finish today’s Guardian crossword, cheating only once, before starting yesterdays. 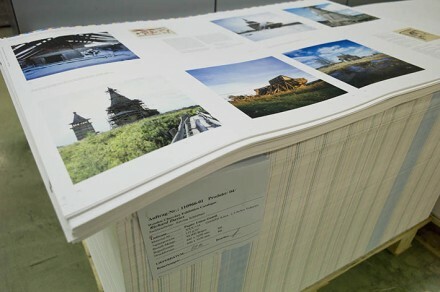 At 21:00 as promised we see the first proof of the day – the end papers – they look good and with added density to Pantone 2767 they look even better. Then Ståle notices a pinhole and the plate has to be remade. Three hours and two proofs later it is time for supper. Everything goes smoothly through the night – we kip on our camp beds between checking the sheets – coffee is brought at 7am – 4 more sheets to go!! The final sheet is inspected around midday – a few minor adjustments and it’s sent to press – we send it off with a pathetic sleep deprived cheer and wander back to our holding bay through a print shop strewn with stacks of Wooden Churches. In a couple of weeks or so 2000 books duly bound, embossed, fly leafed and shrink wrapped will turn up in England. It will be wonderful to see them with fresh eyes. You are currently browsing the Holy Rus' Log Blog blog archives for December, 2011.